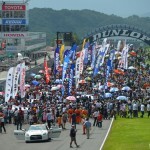 On July 28, the “SUGO GT 300km RACE,” Round 4 of the AUTOBACS SUPER GT series, was held at Sportsland SUGO (one lap: 3.704 km x 81 laps) in Miyagi Prefecture. 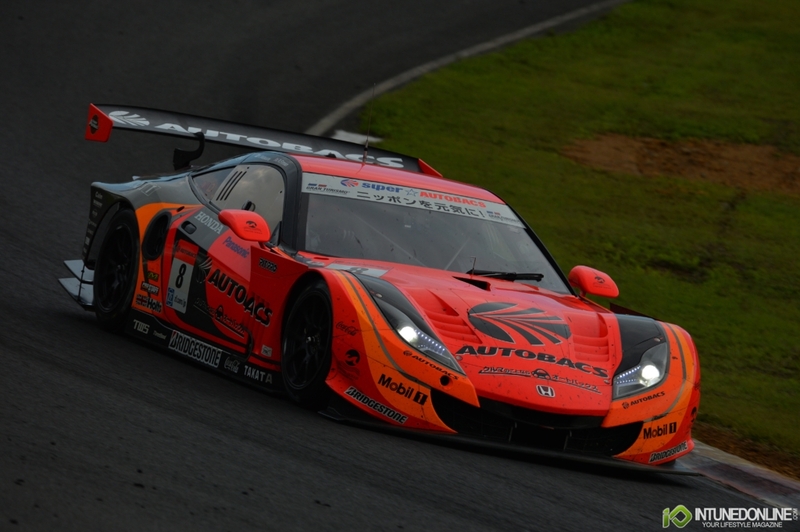 In the GT500 class, the No.8 ARTA HSV-010 driven by Ralph Firman and Kosuke Matsuura won the team’s first victory in three years. 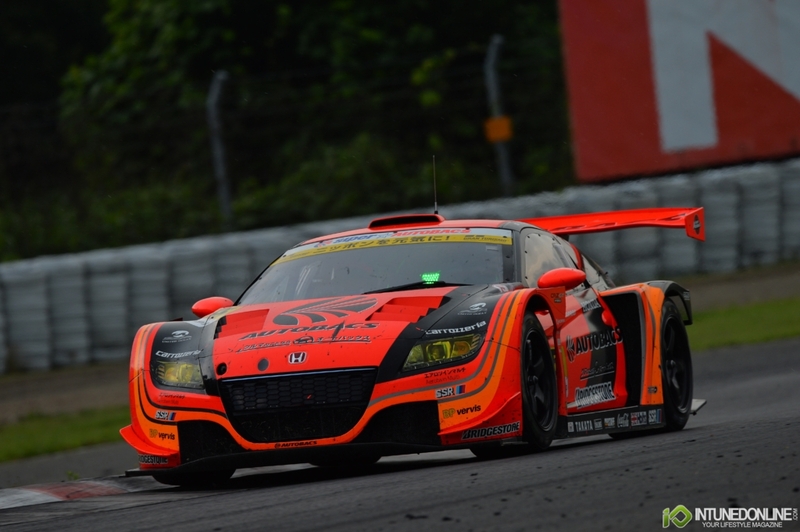 In the GT300 class, the No.55 ARTA CR-Z GT driven by Shinichi Takagi and Takashi Kobayashi took its second straight series win, giving ARTA victory in both classes. 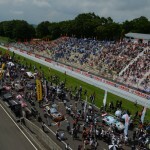 With a rapid improvement in the weather, there were patches of blue sky with strong sunlight streaming through and an air temperature of 26 degrees C. and a track temperature of 40 C. as the 81-lap race got underway at 2:00 in the afternoon. When the race started the track was completely dry for the first time in the race weekend. 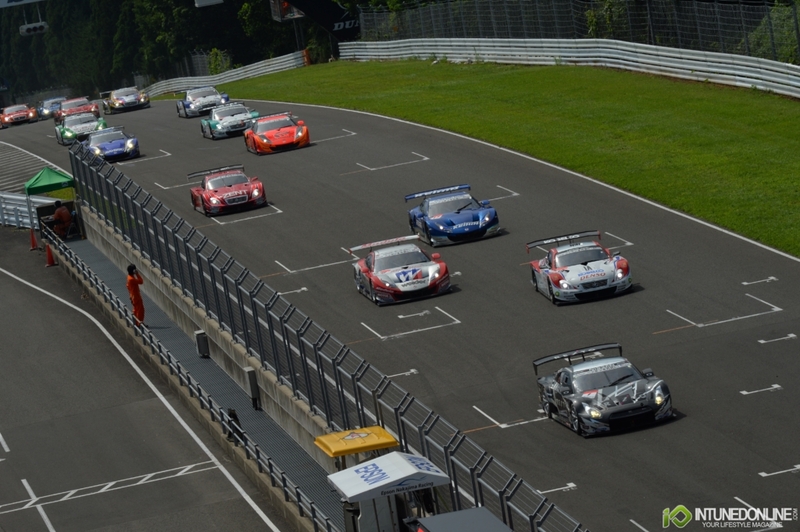 After one formation lap, the race roared in action at 2:03. It was the pole-starting No.1 REITO MOLA GT-R (Yuhi Sekiguchi) that got the hole shot and was followed through the first four laps by the No.39 DENSO KOBELCO SC430 (Hiroaki Ishiura), No.18 Weider Modulo HSV-010 Naoki Yamamoto), No.17 KEIHIN HSV-010 (Toshihiro Kaneishi), No.38 ZENT CERUMO SC430 (Kohei Hirate) and No.8 ARTA HSV-010 (Ralph Firman) with no changes in their starting order. On the fifth lap, though, the No.17 KEIHIN HSV-010 running in 4th position suddenly slowed down with drive train trouble and returned to the pit. Around the same time, the No.12 CALSONIC IMPUL GT-R (Tsugio Matsuda) running in 14th position suffered suspension trouble the forced a return to the pit road, where Matsuda brought the car to a stop on the green. With this two cars were suddenly out of the competition. 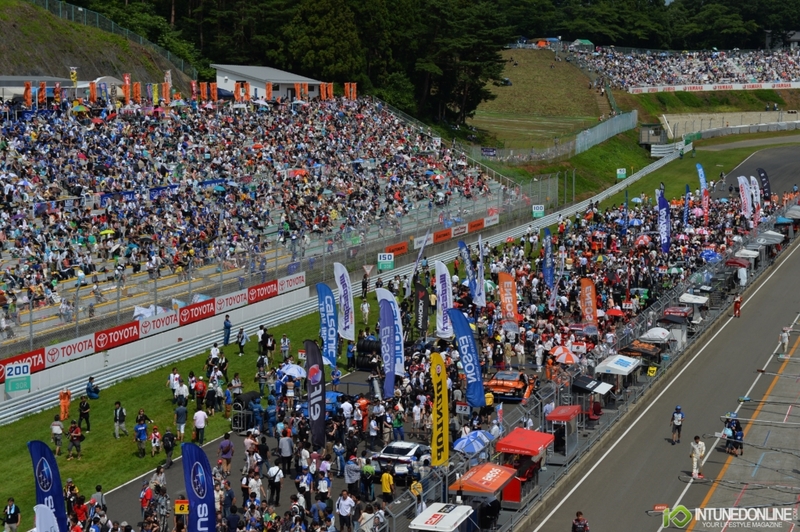 By the sixth lap, GT300 back markers were already appearing in front of the GT500 lead group, where the No.1 REITO MOLA GT-R and the No.39 DENSO KOBELCO SC430 were separated by only a few tenths of a second in a close contest for the lead. Even while struggling to work through the back markers in front of him, Sekiguchi managed to hold off Ishiura’s challenge and keep his lead. 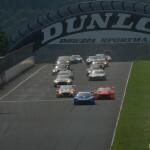 Behind them, the No.18 Weider Modulo HSV-010 and the No.38 ZENT CERUMO SC430 battled at close quarters, and throughout the field the competition was hot from the outset. On the 14th lap, the No.36 PETRONAS TOM'S SC430 (James Rossiter) that had been running in sixth position was given a drive-through penalty for having jumped the start. After executing the penalty on the next lap No.36 PETRONAS TOM'S SC430 had dropped to the very back of the pack. 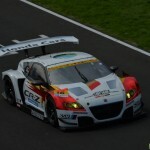 Then on the 15th lap, Yamamoto in the No.18 Weider Modulo HSV-010 got caught behind a back marker on the final turn and was overtaken in a thrilling move by fast approaching Hirate in the No.38 ZENT CERUMO SC430 in which he squeezed through on the inside almost scraping the concrete wall along the home straight. This moved thee No.38 ZENT CERUMO SC430 up into 3rd position. On the 18th lap there as another overtake that saw No.37 KeePer TOM'S SC430 (Andrea Caldarelli) move past the No.8 ARTA HSV-010 into 5th position. 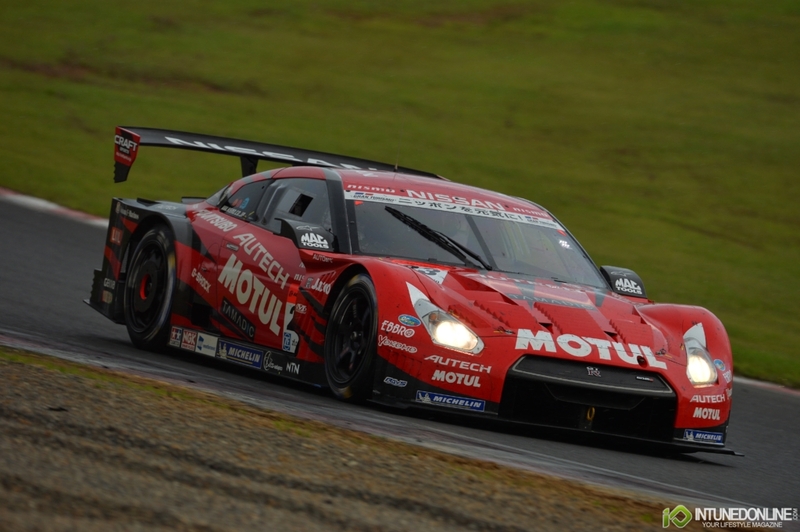 Meanwhile, the No.1 REITO MOLA GT-R and No.39 DENSO KOBELCO SC430 had been pulling away from the No.38 ZENT CERUMO SC430 in third position in an ongoing battle that saw the two machines running within a few tenths of a second of each other but, nonetheless, failed to produce any changes in the order all the way through to the 40th lap, when the two cars both pulled in for their routine pit stop. The battle between the two leaders in effect came down to a battle of pit work, which the No.39 DENSO KOBELCO SC430 team took 31.2 seconds to complete versus 34.8 sec. 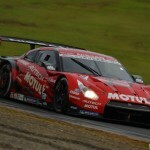 for the No.1 REITO MOLA GT-R. This difference enabled the No.39 DENSO KOBELCO SC430 to return to the track in the lead. 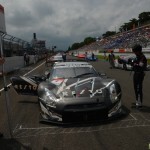 The No.38 ZENT CERUMO SC430 that had assumed the lead on lap 43 made its pit stop, changed drivers from Hirate to Yuji Tachikawa and was able to get back in the race in front of the No.1 REITO MOLA GT-R (Satoshi Motoyama). Tachikawa and Motoyama proceeded to stage an intense, close-fought duel that saw their machines brushing each other at times until the 48th lap, when Motoyama tried to take Tachikawa’s inside on the first turn while Tachikawa tried to hold him off from the outside. The result was a collision between the two on the second turn. This allowed the closing No.18 Weider Modulo HSV-010 (Frederic Makowiecki) to take advantage of the accident and move into 2nd position, and although the No.38 ZENT CERUMO SC430 was able to recover and continue the race in 3rd position, the No.1 REITO MOLA GT-R suffered a burst left front tire and had to return to the pit and fall out of contention. 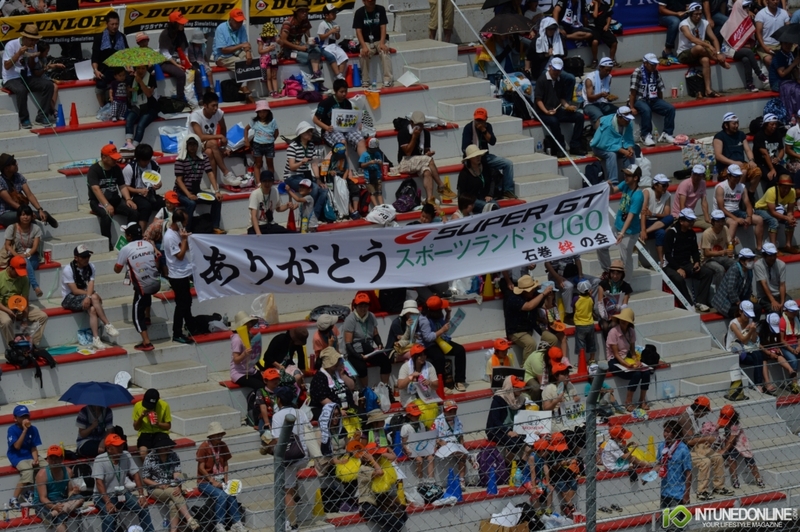 The confusion had given the No.39 DENSO KOBELCO SC430 (Juichi Wakisaka) a big 10-second margin of lead that would normally have put him in position to drive on easily to the win, but everything changed when rain began to fall from around lap 55. As the rain gradually growing stronger the lead machines could do nothing but continue to run as best they could on their slick tires, and in the rain Wakisaka was being outpaced by Makowiecki, Tachikawa and also Kogure in the No.100 RAYBRIG HSV-010. By the 66th lap they had caught up with Wakisaka and the race for the lead was soon a contest of four machines separated by only a few tenths of a second. 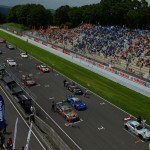 Of the four, the faster pace of the No.38 ZENT CERUMO SC430 enabled it to pass the No.18 Weider Modulo HSV-010 on lap 67 and then the No.39 DENSO KOBELCO SC430 on the second turn of lap 68 to take the lead. The drama was far from over, however, as Wakisaka held on to Tachikawa and continued to battle him for the lead as they worked their way through back markers. Finally, on lap 70 both tried to pass a GT300 car simultaneously on the Rainbow Corner, Tachikawa from the outside and Wakisaka from the inside. As the three machines ran side by side they collided, causing Tachikawa to spin out and get stuck in the gravel on the outside of the turn. Meanwhile, the collision had caused Wakisaka to lose speed and allow Makowiecki and Kogure to pull alongside him as he exited the turn, Makowiecki on the inside and Kogure on the outside. The result was another 3-car collision. The No.18 Weider Modulo HSV-010 spun out and crashed into the guardrail. The No.100 RAYBRIG HSV-010 suffered damage to its left rear tire and suspension that forced it to return to the pit, from which it was not able to return to the race. These events put the No.39 DENSO KOBELCO SC430 in the lead once again, though Wakisaka’s machine also suffered from damage. On the 73rd lap his right rear tire burst, causing him to spin out. 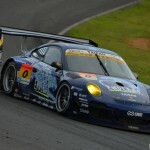 He returned to the pit to replace the tire and was able to return to the race a lap behind in 4th position. 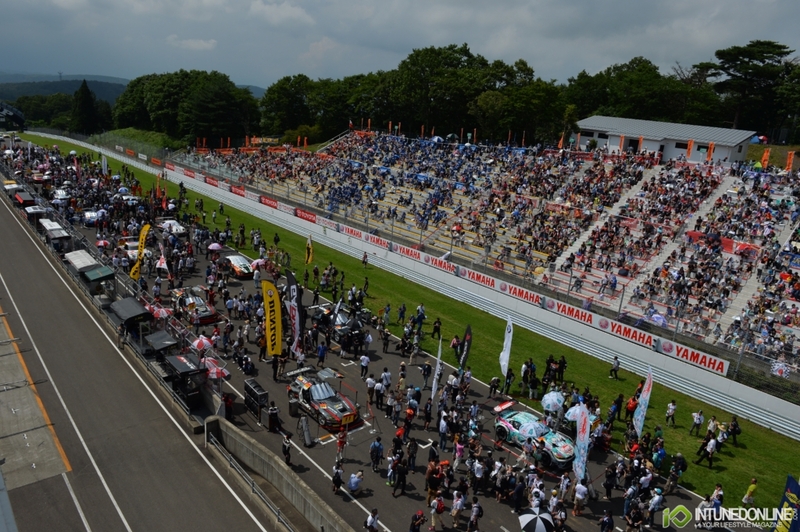 Assuming the lead now was the No.8 ARTA HSV-010 (Kosuke Matsuura), having passed the No.37 KeePer TOM'S SC430 (Daisuke Ito) on the High Point Corner of lap 73. 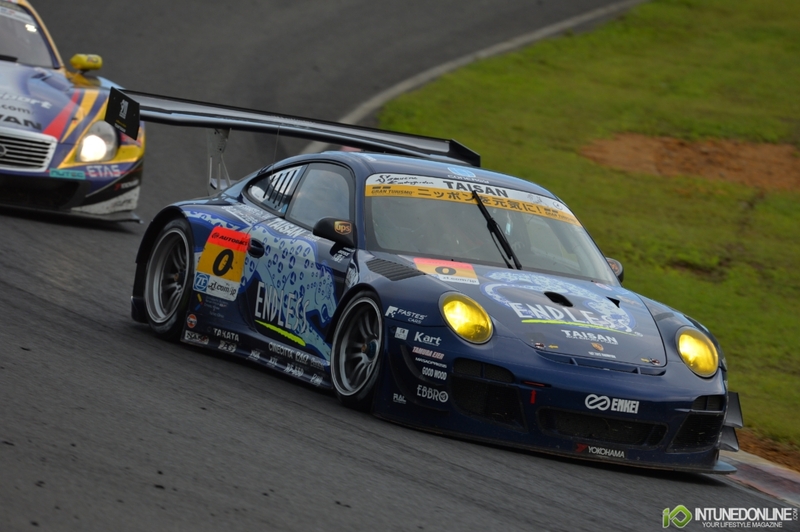 Ito continued to give chase in hopes of a second consecutive SUGO win but Matsuura succeeded in holding him off and ran on to his first GT500 victory. 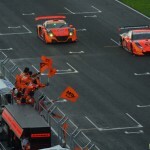 For the No.8 ARTA HSV-010 it was a long-awaited first win since the Suzuka 1000km race of 2010. 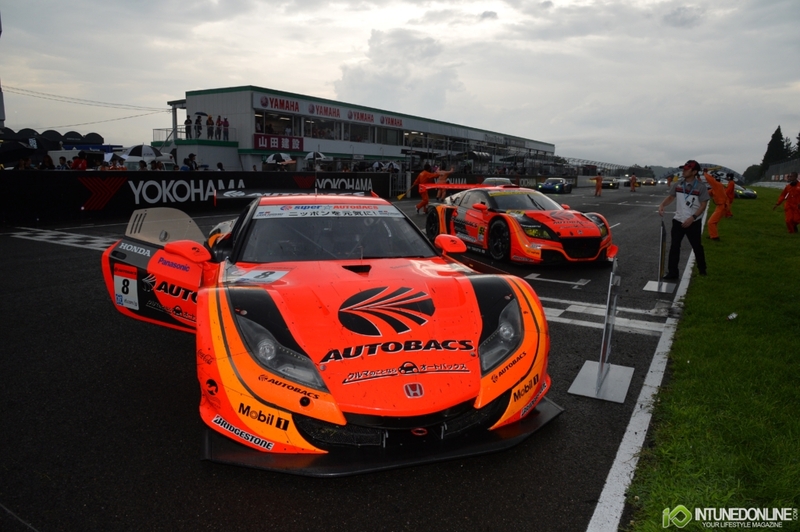 In the GT300 class, the No.55 ARTA CR-Z GT also won, and to cap off an exceptional weekend for the ARTA team, the two ARTA machines ran side-by-side for a final lap. Finishing 2nd was the No.37 KeePer TOM'S SC430. 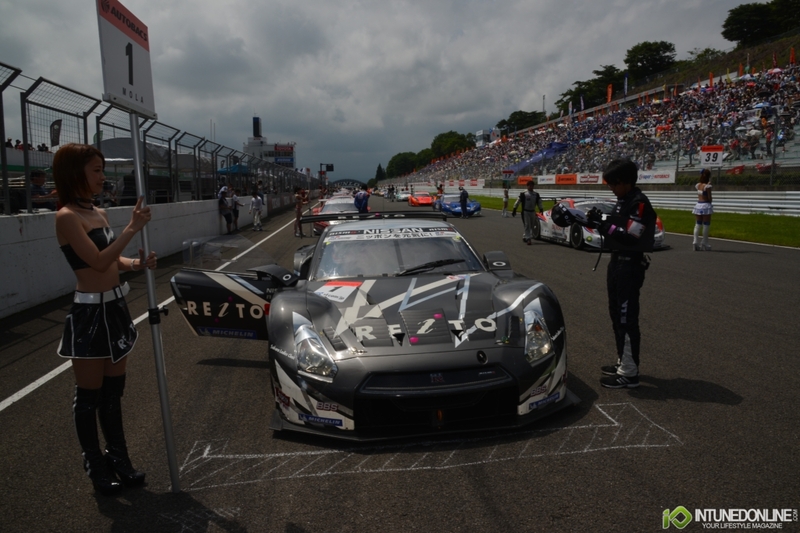 The No.23 MOTUL AUTECH GT-R finished 3rd, and these were the only three machines to finish on the same lap. It was a testament to the many upsets that occurred in this race of survivors. 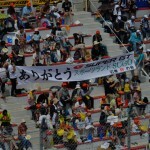 When the fourth round and all its upsets were over, the No.100 driver pair of Izawa and Kogure still topped the series standings despite having won no points in this race. Second in the standings is the No.39 pair of Wakisaka and Ishiura, and 3rd is the No.12 pair of Matsuda and De Oliveira. 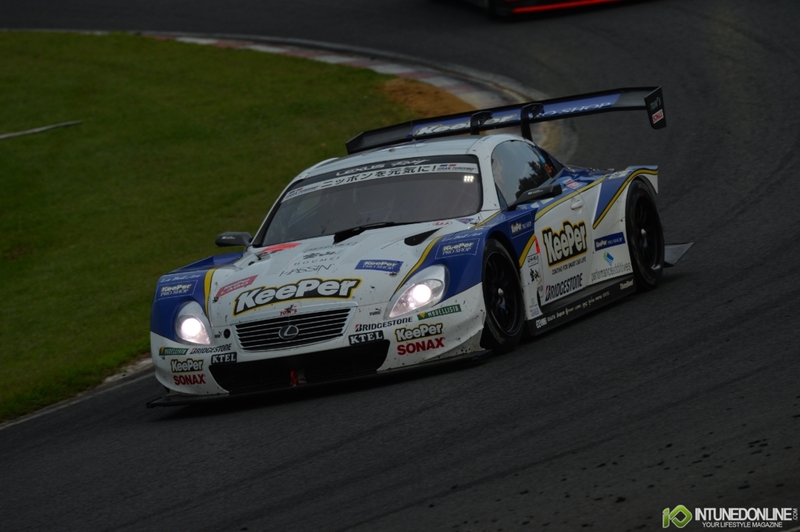 The winners of this race, the No.8 team of Firman and Matsuura move into 4th in the standings. 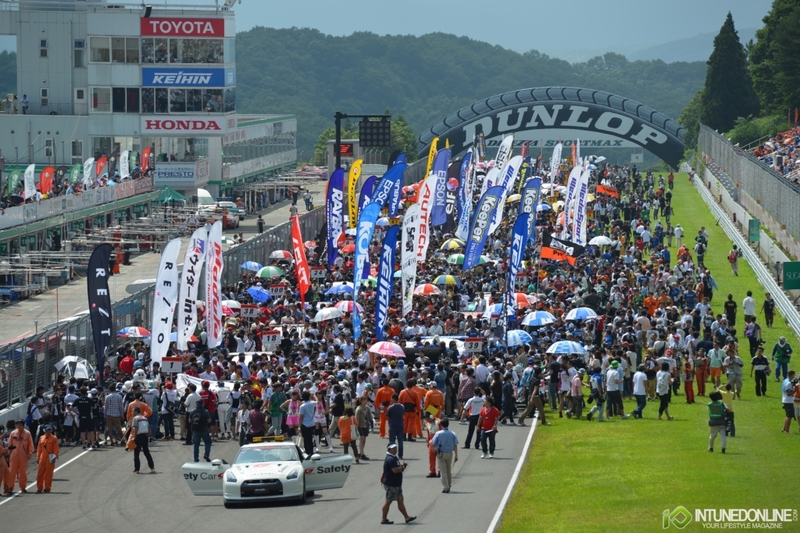 The GT300 class race began with an excellent start by the No.61 SUBARU BRZ R&D SPORT (Tetsuya Yamano) from pole position that got it through the first turn ahead of the strong-accelerating hybrid car No.55 ARTA CR-Z GT (Shinichi Takagi) and the No.16 MUGEN CR-Z GT (Hideki Mutoh). In contrast, the other hybrid, the No.31 Panasonic apr PRIUS GT (Morio Nitta) suffered clutch trouble in the warm-up run before the start. Some very fast repair work managed to get the machine into the race, but it was one lap behind the field at that point. From there it was unable to finish in the points. 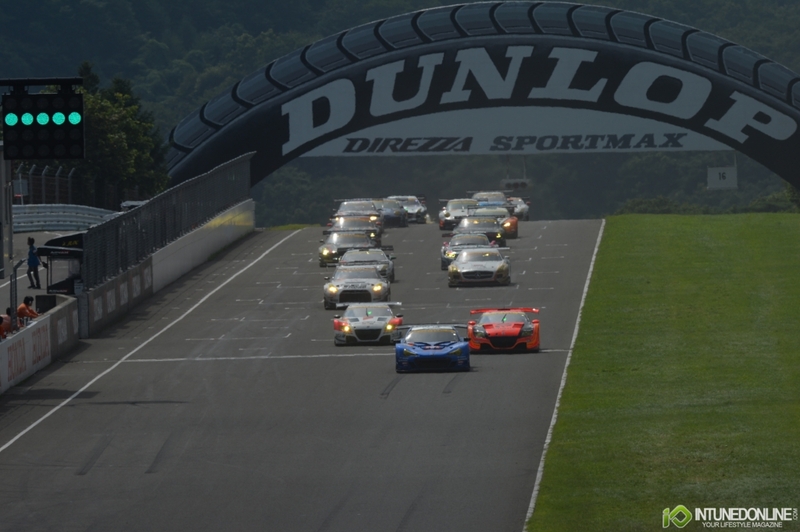 In the lead, the No.61 BRZ was gradually able to open up a margin of lead over the two pursuing CR-Z machines, No.55 and No.16. By lap 18 it had a lead of four seconds over No. 16, which had passed No.55 into 2nd place by that time. 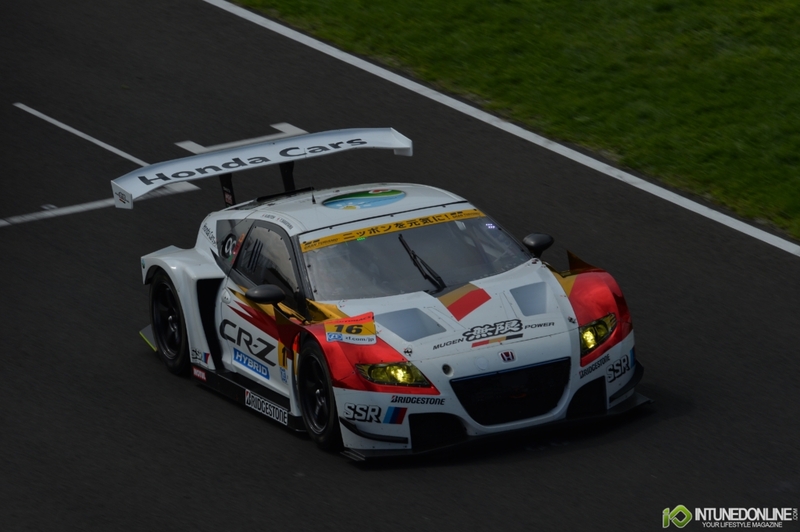 However, while the CR-Z machines continued to run laps consistently in the 1’23-24 range, the pace of the No.61 BRZ gradually began to fall off. After seven laps the margin of lead had disappeared, and on the straight of lap 28, No.16 moved past it into the lead. Now running in 2nd position, the No.61 BRZ chose to be the first of the leaders to make its routine pit stop. This move pinned the team’s hopes on second-stint driver Kota Sasaki to win back the lead. 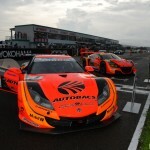 Next, the No.16 MUGEN CR-Z GT made its pit stop, followed two laps later by the No.55 ARTA CR-Z GT. Completing its pit work faster than the somewhat slow No.16 team, the No.55 team was able to get its second-stint driver Takashi Kobayashi back on the track in front of Yuki Nakayama in No. 16 and in the lead. 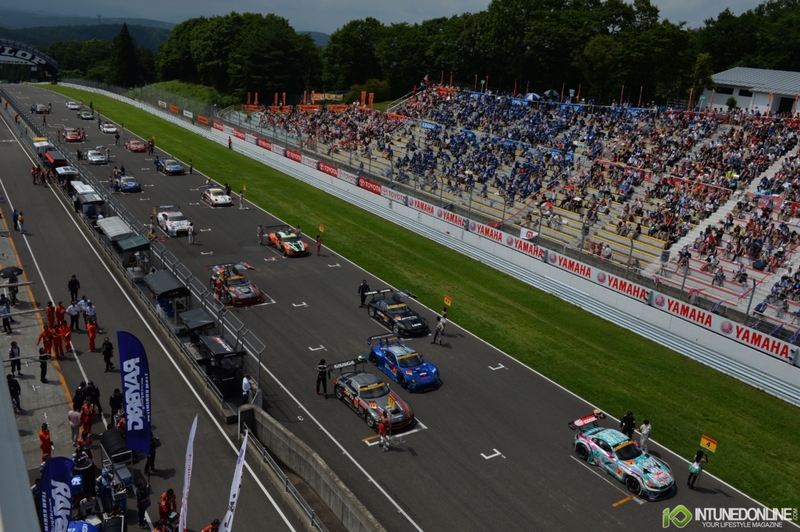 In the second half of the race, the leader was the No.55 ARTA CR-Z GT (Kobayashi), followed by the No.61 SUBARU BRZ R&D SPORT (Sasaki) just over three seconds behind in 2nd and the No.16 MUGEN CR-Z GT (Nakayama) another eight seconds back in 3rd. After the 50th lap rain began to fall. Car No.61, which had closed to within 2.5 seconds of No.55 at one point, now began to slow down in the rain. By the time the track had turned a wet black, team No.61 decided to return to the pit and change to rain tires. This dropped No. 16 back to 4th position, but with the hope of recovering the lead with the rain tire advantage. 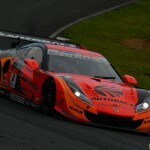 However, Sasaki was unable to run faster laps than the two CR-Z teams that had chosen to race on with their slick tires. Running in 4th position at the time, the No.11 GAINER DIXCEL SLS (Bjorn Wirdheim) team also opted to change to rain tires but the gamble failed by dropping it back too far to finish in the points. 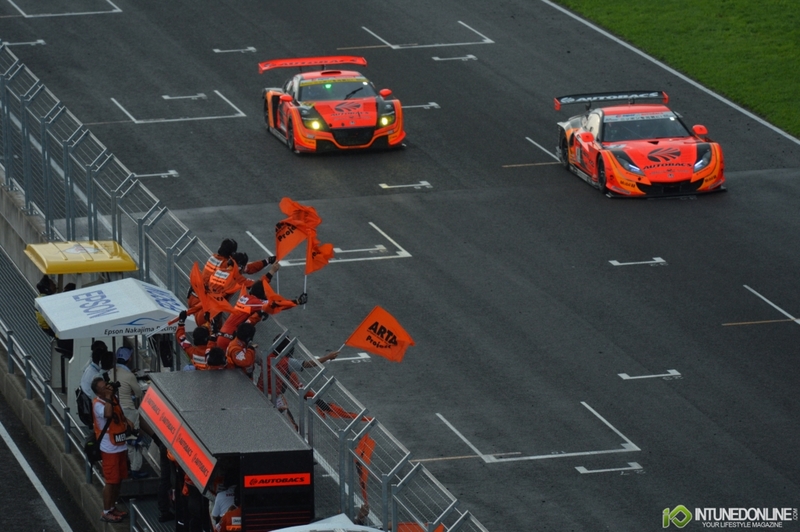 Now the race for the win was down to the fleeing Kobayashi in the ARTA and the chasing Nakayama in the Mugen car. But, with 15 laps remaining, the gap between the two cars was 16 seconds. With the rain growing harder at times and then lighter again, the track conditions were treacherous. 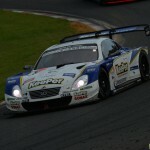 Still, Kobayashi was able to drive on at a steady pace to the win. 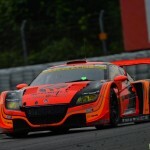 This gave the ARTA CR-Z GT its second straight victory, following the win at Sepang in the previous round. The MUGEN CR-Z GT finished 2nd and the defending champions, the No.0 ENDLESS TAISAN PORSCHE (Kyosuke Mineo > Naoki Yokomizo) managed to finish 3rd. No.0 had pulled off an amazing recovery by working up steadily from a 15th-position start and further closing the gap with fast pit work and the fast pace of Yokomizo after the track got slippery. 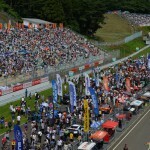 With these results, the No.16 driver pair of Mutoh and Nakayama has moved to the top of the series standings, while two consecutive victories have moved the No.55 pair of Takagi and Kobayashi into second place and the No.11 pair of Hiranaka and Wirdheim drops from the top position to 3rd by no-pointing in this race. 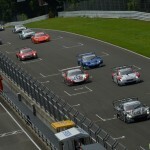 The 2012 Season Opener for CSCS is here!